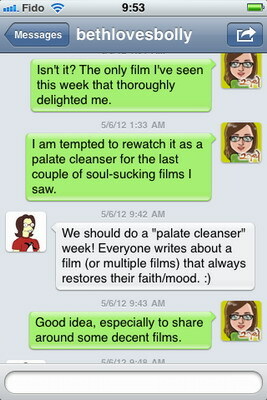 Because sometimes movies are blah or boring or bad, the wise film-watcher has at their disposal a stash of spirit-lifters and faith-restorers. 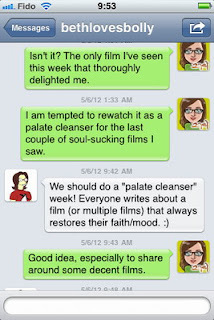 Totally Fimi and I are hosting a week of "palate cleansers," starting today, and we invite one and all to join us in writing about and otherwise sharing movies (and bits thereof) that make us feel better. Follow the conversation on twitter with the hashtag #PalateCleanser. I hope to put up a new post every day. I'm starting off with a handful of songs because they're the simplest, most discrete unit of fillums I could think of. So sunny and floral! Such cute smiling faces! Such dorky, endearing choreography! And if Akshaye Khanna can keep up with Madhuri Dixit as well as this, then surely there is hope for us all. Palate-cleansing is not necessarily the same thing as happy-making, but my personal list sees significant overlap of those traits. What I find so restorative about this picturization (not the music itself, really) is that somehow, somewhere, somebody pitched the idea of a song with Fardeen-Khan-based hero-worship-type shenanigans, including cheerleaders, breakfast foods, motorcycles, and Kolkata public transit, and they were allowed to go ahead with it and it worked really well for at least one viewer (i.e. me). Again, if somehow all of this did not end up a hot steaming dead mess under the wheels of a tram, then surely you and I can solve whatever is troubling us—and, more to the point, there is hope for cinematic endeavors everywhere. I try very hard not to think bad things about people who don't like what I like, but I'm willing to go out on a limb with this one and declare that if it does not tickle any part of your fancy at least a little bit, you might be a robot. This song makes me proud to be a human. It is colorful, joyful, thoughtful, clever, and interesting. It is harmonious in many ways and on many spectra: within the music, within the visuals, within the choreography, and among them all. Creating something like this is proof of what people can do when we try. Like that! Wicked! WHEE and SQUEE and WHOOPEEEEEE! I wrote a full post on this song back in 2008 if you need more tempting in words. I, for one, cannot sit still. Won't you Shashi-shimmy along with me? Fardeen Khan is generally uninspiring, but "Good Morning India" had me smiling and tapping my feet—a miracle. "Tumse Milke" is just brilliant. Madhuri and Shashi? Sheer genius. This post made my day! Very cute! And I thought I was the only one who liked Akshaye and Madhuri together in Mohabbat...now that made my day. He was so cute in that one. Jenny K - I haven't seen the whole film but I would love to. I'll watch almost anything for Akshaye. I didn't remember "Suniye To" at all but SRK is certainly ALL IN! I'm enjoying the rockstar bit especially.